It's Memorial Day in the States. Every respectable U.S. news website - left or right-leaning, pays respects to fallen soldiers. 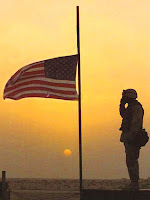 Whether you believe lives were lost in defense of freedom or that lives were wasted because war is never the answer, still every segment of society (lunatic-fringe aside) acknowledges the appropriateness of mourning over soldiers who lost their lives. Conservative, liberal, religious, not religious, black, white or anything in between - it makes no difference. I couldn't help but think about the contrast to Yom HaZikaron, Israel's Memorial Day, where indeed one segment of society - sizable, vocal, unified, intensely ideological - not only refuses to appreciate and express gratitude toward soldiers who've put their lives on the line in order to ensure the survival of the Jewish State, who make their life/lifestyle in Eretz Yisrael possible, but refuses to even acknowledge a day where we mourn the dead. No gratitude, no tears. They will have none of it. I don't have terribly much to say here, except that every sane, decent, normal society - even if it vehemently disagrees on important issues - should be able to unite on the issue of mourning the dead. It's so obviously human it goes without saying (or at least it should). And there is something deeply wrong, perversely wrong, with a society wherein a substantial swath of citizens is so ideologically opposed to the State, so utterly divorced from anything or anyone not within their own "in-group", that they cannot even muster the basic humanity required to pause and honor the dead. As a resident and citizen of Israel, I'm disgusted and embarrassed that we can't even get it together for something as straightforward as Memorial Day. Yes, yes, "two Jews, three opinions" and all that - it's just part of the unique idiosyncratic nature of Am Yisrael, yadda yadda... But come on, we're talking basic common decency here! That's the thing - it's ideology over decency, over common sense, over basic humanity. On this particular count, America puts Israel to shame. 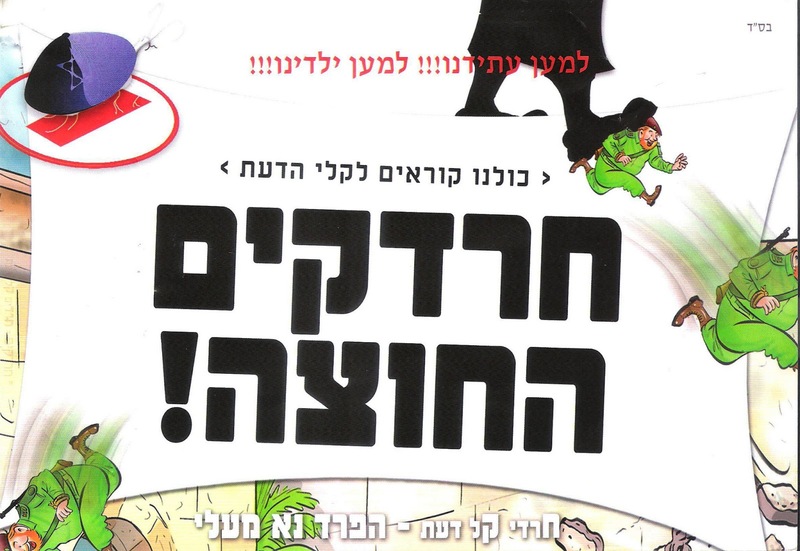 "Chardakim": Hysterical, Fear-based Propaganda - Just for Kids! 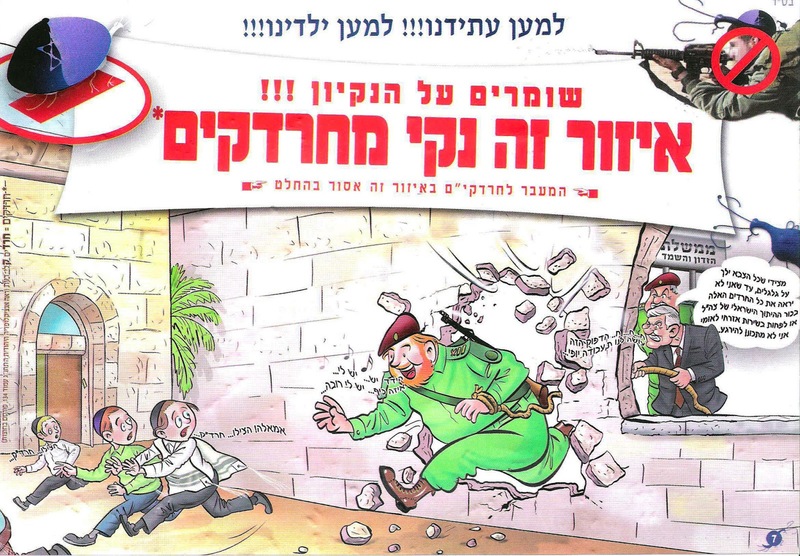 The anti-army, anti-State-of-Israel wing of the Charedi community has once again outdone itself, creating this lovely little comic leaflet which it has littered the streets with, coining a new term for Charedim who join the army: "Chardakim". They call it an acronym for "Charedim Kalei Da'at" (weak-minded Charedim), but really it's a play on the word "chaydakim" which means bacteria/germs. (You can see a few strange bug-like creatures in the comic which attest to this. Of course they'd have no clue that microbes look nothing like bugs!) Basically, the point being made here is that Charedim who join the army are "idiots" who do the "evil" government's bidding, and what's worse: they're coming after little kids. The term "chardakim" depicts them as "germs," a disease, something to "cleanse" the neighborhood of. This is the message they're hammering into the heads of impressionable kids. It's like I said in a previous post, living in "la-la land" and believing in crazy stuff might work at the Shabbos table, but those crazy-chickens eventually come home to roost, sometimes in the form of insidious propaganda like this, which pumps hysteria and hatred into the next generation of charedi kids. *Chardakim = Charedim Kalei Da'at / Weak-minded charedim - See the Encyclopedia Judaica, p. 134." (Kids running away) "Immaleh, help!" (Charedi soldier bursting through wall) "Hooray, I have it... What fun... I have a rifle..." (Other side of wall, sign reads) "State of Evil and Annihilation" (Man, presumably Netanyahu, says) "It's on my dictate that all the army runs - I won't rest until I see all these charedim on the core curriculum of the Israeli army or at least in national service." "Ha, ha, ha... This idiot is doing our work for us - beautiful!" 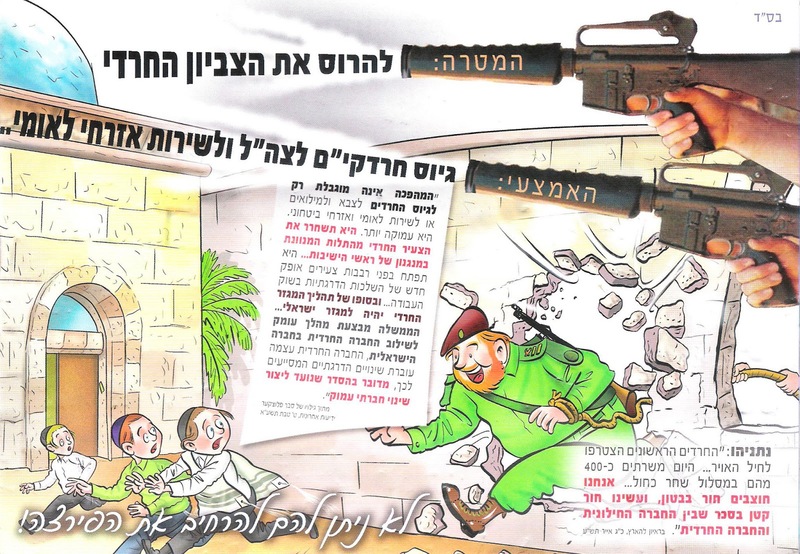 On the other side of the leaflet, it says (using images of rifles and more kids fleeing in fear): "The goal: To destroy the Charedi character. The method: Conscription of Chardakim to the IDF and national service." (With foot stamping on/kicking charedi soldiers) "Chardakim out!" (Other side, showing charedi soldiers being roped in) "The Chardakim decided to meet their end like sheep to the slaughter." (Netanyahu and general) "Don't pressure them - give a little smile, a little money, and they'll be here on all fours." "Ha, ha, ha - these idiots are still smiling. They don't dream of what awaits them." "Come, 'sheepelach', come, it's a Charedi atmosphere." 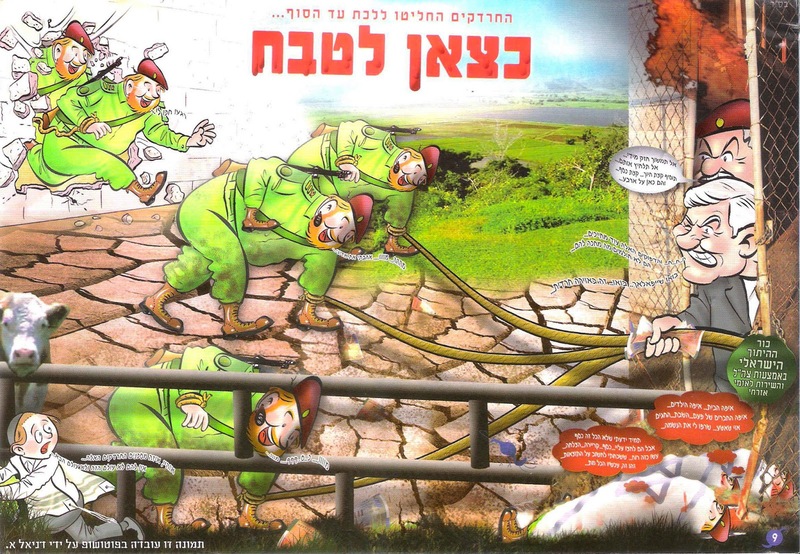 (Charedi soldiers on all fours) "Mooo... Money... Mooo". (Child running away) "Oy, these Chardakim are getting in... They have no Olam Hazeh and no Olam Habah." (Dead charedi soldiers) "Where is the home... where are the children... where are the old friends... Shabbos... Chagim... Oy tatteh... They burned my neshamah." "I always knew that this money isn't everything, but they pressured me... money... career... success... They created this kind of mood, that I forgot to think about the result... That's it - now everything is dead." "There were Tzedukim. There were Kara'im (Karaites). There were Shabatai'im (Shabbatai Tzvi followers). There were Frankistim (followers of Ya'akov Frank - another false messiah). There are Maskilim (enlightened secularists). There are Reformim. There are Zionists. There are Mizrachistim (not even sure what that is - some slight on the knit-kippa community I suspect). And there are also... CHARDAKIM ! Changing identity in the army and in national service." 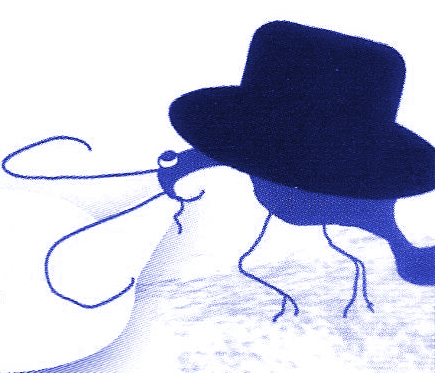 (image of black hat with a bug underneath it) "Enough! I'm already sick of carrying the burden of this black hat. I'm not ready to wait until age 22 in order to be free from it. We have to find a way from age 16. This is already intolerable. If the rabbis don't let the Chardakim advance Charedi society from within, we have to find rabbis to our liking and push our way to the front with them." (On the other side...) "Another solution from the Chardakim factory: 'We're losing out on Parnasah'." 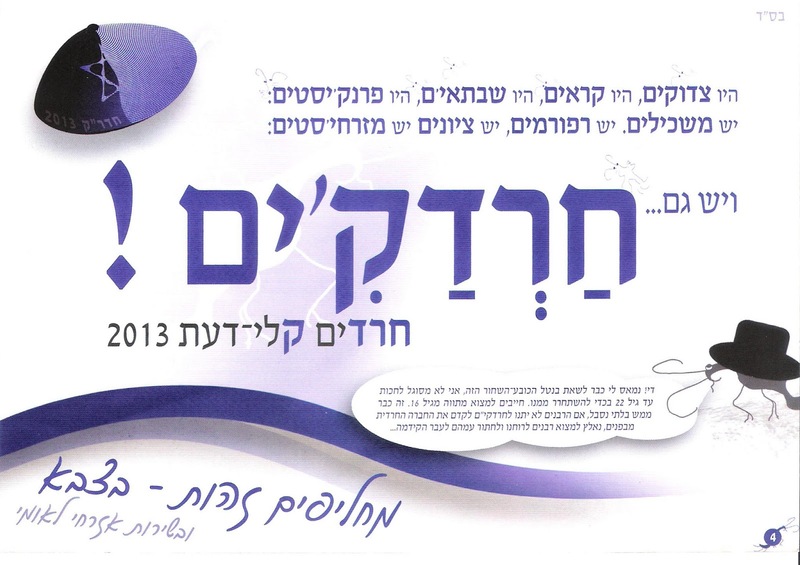 (Image of a Charedi demonstration with the following signs) "Chardak - leave our camp." "Separate from me - don't trample our children." "Go fight Amalek - Chardakim out!" "The Torah states: Separate from a bad dwelling and do not associate with an evil person - the Chardakim are trampling us!" 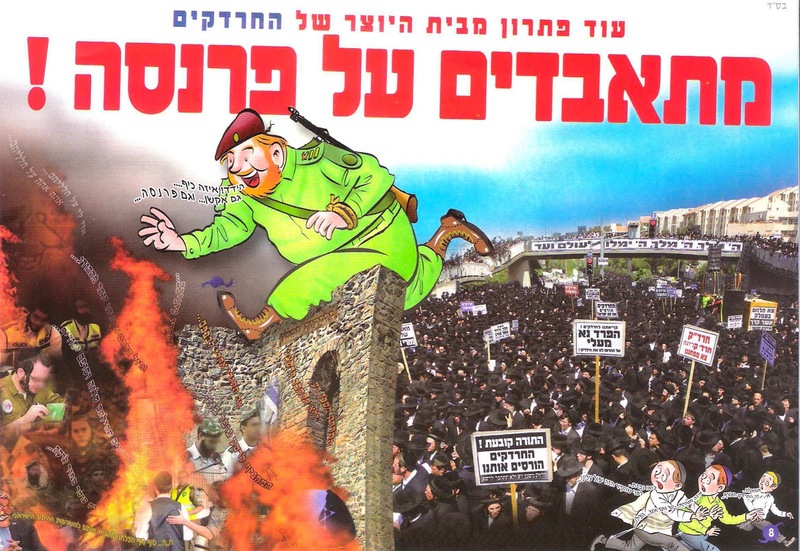 (Charedi soldier jumping from charedi demonstration into flames) "Hooray! What fun... Also action... and also parnasah..."
There's more - honestly it's just too nauseating to keep going. I think you get the idea. It seems they plan to hold a demonstration today. I won't translate that flyer except for this one ditty: "We won't sell our children to snoring hyraxes and gluttonous rabbits and pigs." Do hyraxes "snore"? Not sure (you'll have to ask R. Slifkin), but one thing's for sure - we can't afford to snore. The crazy beliefs and cartoonish depictions of bugs in hats all seem laughable - but these people are deadly serious, and new generations of children are being raised on blind hatred, with no ability to discern for themselves. I'm just glad it's the "Chardakim" who are carrying the rifles - and not them! 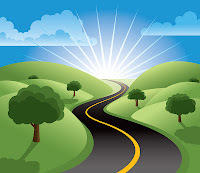 Well, for the first time in my frum life (as far as I recall), I counted each of the 49 days of the Omer with a bracha. Most years, I'm usually "out" within the first two weeks. I miss a Maariv in shul, then forget to say it the next day - and that's it. (And when you "lose the bracha", there's a tendency to lose heart/interest and stop counting the Omer altogether, which is the actual Torah mitzvah - the bracha is just a rabbinic mitzvah. Which is its own problem I'm not getting into here...) Anyway, for all the Omer-related drashot people make about "counting" and "being counted", if there's one thing you could pretty much count on, it's me forgetting to count the Omer. So how'd I do it this time around? A daily alarm on my smartphone. Simple as that. Now... The point of this post is not (just) to offer myself self-congratulations. It's to talk about the significance I ascribe to finishing the Omer with a bracha... Cosmic significance?... Zero. Mitzvah points?... Doesn't concern me. Hashem loves me for it?... Come on, you know me better than that! So why does it matter one iota whether I complete the Omer, or even count one single day of it for that matter? In the objective sense, IT DOESN'T. I don't believe I accomplished anything for the Jewish people, for the world, or secured any reward for myself. I won no favor with God, pulled no strings in shamayim. What I did was this: I set a goal for myself, figured out what it would take for me to reach that goal, implemented a solution - and I was successful. It was 100% a personal exercise. That's all. I'm one of these people who admittedly has trouble committing myself to doing something day-in-and-day-out for any considerable stretch of time. Inevitably something comes up - either I forget, or I get distracted, or I'm not feeling well, or I'm just plain lazy - any number of reasons/excuses which come up in life. So to set my mind to it and actually do this for 49 days straight IS an accomplishment for me. And it also has the effect of "mitzvah goreret mitzvah" - where one mitzvah "drags" another one along with it. Meaning, when you do something right, you "build muscles" which make it easier to do the next time. If I'm consistent with something like counting the Omer, it builds the confidence and experience that can make it easier for me to be consistent in a different context... and maybe, hopefully, with something that really and truly "counts". A good Chag Shavuot to all!